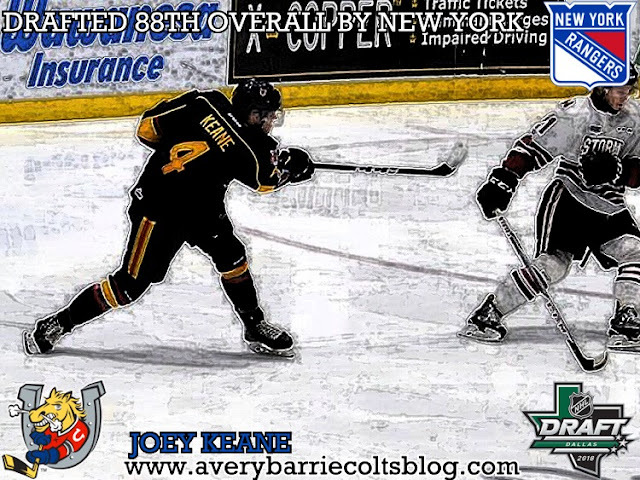 Joey Keane drafted 88th overall by New York Rangers. #NHLdraft - Very Barrie Colts | A website covering the Barrie Colts of the OHL. The New York Rangers have used their 88th overall draft pick to select Barrie Colts defenceman, Joey Keane. Keane finished the 2017-18 season registering 12 goals and 32 assists through 62 regular season games. In the playoffs he put up 7 assists in 12 games. Over 2 OHL seasons, Joey 50 assists and 63 points in games. Getting picked 88th overall might look early for a player who was ranked 111th by NHL Central Scouting among North American players. Date of birth: July, 2 1999. Place of birth: Chicago, IL.